This portfolio showcases achievements during my experience in the School of Information Science and Learning Technologies (SISLT) doctoral program at the University of Missouri—Columbia. Use the menu at the top to read about my system design experience, research accomplishments, teaching experience, program of study, and professional service and participation. I am fortunate to apply the knowledge and skills acquired through coursework directly to my professional role as an instructional designer at MU School of Medicine. In this role for five years, I serve as lead functional designer and change agent for web application innovations, I collaborate with colleagues to routinely assess medical student performance, and I collect and analyze outcome data to improve our curriculum. In addition, I serve on grant-funded evaluation teams and disseminate my work at regional, national, and international meetings. I am fascinated with how technology can be used to increase productivity and performance and also serve as a tool for educational improvement. My design-based research interest focuses on the processes used to design effective educational improvement innovations. In addition, I believe the same processes can be used to evaluate and design innovations that improve interprofessional teamwork in healthcare. My theoretical perspective directly influences my work as a “work ethnographer.” In my role as functional designer, I design web applications for educational innovations. After a complex problem is identified, I use a situated action approach to design in which I participate in the business process conducting task analysis with key stakeholders to predict and understand their work behavior. I categorize my situated action approach to design as symbolic interactionism because I observe the social reality within my work organization to understand how specific work gets done. As Crotty (1998) notes, a central theme of symbolic interactionism is to put oneself in the place of the other. By joining and participating in the work process in which a complex problem exists, I gain a deep understanding of what is needed to address the problem and how innovations can solve problems and make the process more efficient. The dimensions of analysis in cognitive work analysis (Fidel & Pejtersen, 2005). I categorize the theory I use to guide task analysis—Cognitive Work Analysis (CWA) and Kim Vicente’s (2004) five levels of human behavior to identify information constraints—as interpretivist. CWA helps guide the design of useful technologies in the work place. In regards to information behavior, the methodology guides the analysis of human-information interaction to inform the design of information systems (Fidel & Pejtersen, 2005, p. 88). The methodology considers the “actors” that use the performance support systems—the work they do, their information behavior, the context in which they work, and the reasons for their actions. To me, these elements make up the “meaningful matrix” that guides work-life. CWA takes a holistic approach and outlines five dimensions that influence information seeking behavior: 1) work domain analysis, 2) organizational analysis, 3) task analysis in domain terms, 4) task analysis in decision making terms, and 5) actor’s resources and values. The methodology suggests that the best way to analyze information behavior is to deeply understand the constraints in these dimensions. Vicente (2004) uses CWA to link social and technological structures. For Vicente, design of technology begins by identifying a problem worth solving and then tailoring the technology to specific, relevant human factors. Vicente terms the relationships between humans and technology “Human-tech.” The Human-tech approach considers only the human characteristics that are relevant to the specific design problem. A context-specific, problem-driven approach narrows down the kind of knowledge about human behavior we need to consider for effective design. Vicente organizes this knowledge into five levels: political, organizational, team, psychological, and physical. 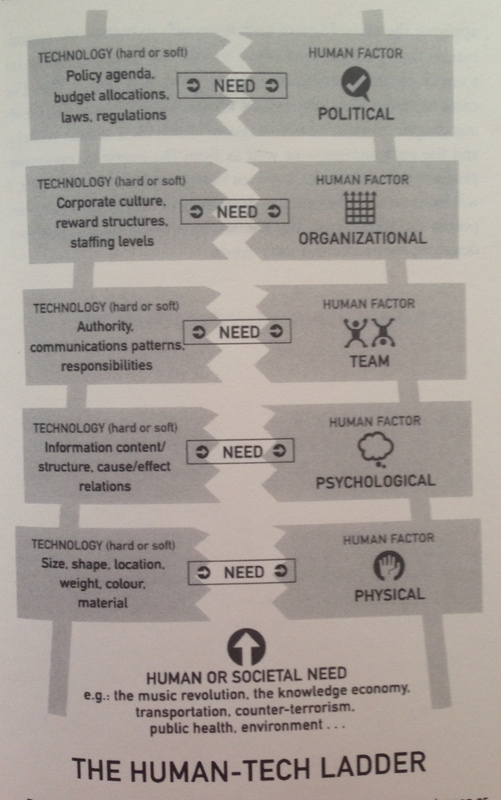 The Human-tech ladder (Vicente, 2004). The physical perspective includes human characteristics such as strength, dexterity, and preventing repetitive strain injury. The psychological level includes short- and long-term memory and the ability to perform mental calculations. The team perspective includes how people work together to carry out goal-directed activity and team member communication. The organizational level includes the vision, leadership, and policies of a group of people and the way information flow impacts organizational behavior. Finally, the political perspective includes public opinion, social values, cultural norms, etc. (Vicente, 2004). I believe that because the end results of programming a complex web application are objective rules (e.g., if the user does this, this happens; if the user does that, that happens), the field of web design often leans too heavily on the positivist side. The social world in which work is performed within an organization needs to be deeply understood to design an effective web application, and the objective rules programmed into an application should embrace and be guided by the “human factors” at the physical, psychological, team, organizational, and political levels. A lack of understanding of the social world in which work is performed is why many “out-of-the box” software solutions fail—oftentimes these solutions do not fit into the processes and structures of a work culture and unless stakeholders are willing to adjust their culture and processes to fit the software (this can be nearly impossible at times), the system is not effective. Ethnography is a common method for system design. Work ethnographies have identified orientations for design, including the creation and use of shared artifacts and structured communicative practices (Suchman, 1995). I combine ethnography with design-based research to align my designs with their ultimate embedded contexts-of-use as understood and mediated by those engaging in the activities (Bell, 2004). Crotty, M. (1998). The foundations of social research: Meaning and perspective in the research process. London: SAGE Publications Ltd.
Fidel, R., & Pejtersen, A. M. (2005). Cognitive work analysis. In K. E. Fisher, S. Erdelez, & L. McKechnie (Eds. ), Theories of Information Behavior (88-93). New Jersey: Information Today, Inc.
Vicente, K. J. (2004). The Human Factor: Revolutionizing the Way People Live with Technology. Psychology Press.